. . .until death catapulted her into a seductive world she never imagined. Falling Angels on a mission to save the world, a popular topic but one that I was intrigued to read about. Seeing how these falling angels fell in love while fighting evil had me opening this book in anticipation for some amazing action, romance and lore. The action was a world wind, things began instantly and continued throughout the story. Death and danger around every turn. The romance was sizzling. I enjoyed the constant interaction between Allie and Raziel and they came to terms, fighting their growing romance and battling the evil villains. I enjoyed seeing their relationship grow from being enemies to lovers to mates. The Villains called the Nephilim sure did pack a punch, bringing the evil danger that the story needed. 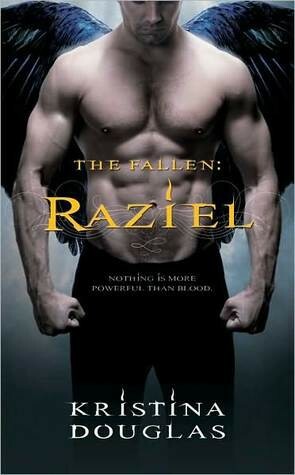 While I do enjoy a good Angel/falling angel tale, it took me quite a while to get into what was going on. Trying to fully understand what their ultimate agenda was. Though I did enjoy Allie and Raziel’s sizzling romance, I wanted to connect more with them as individuals. So that I could care more about them as characters and I didn’t really get that. The story left me a bit confused at times with the way things were set up. It left me with more unanswered questions than I would have liked. Raziel by Kristina Douglas was a good story filled with awesome action, sizzling romance and villains that gave these fallen angels a run for their money. While I did have some issues with the story that didn’t make me absolutely get into it and love it. Since this is just the start of the series maybe I will give the next story a shot and see where things goes.